This little relic I've had since high school and is my still trusty checkbook calculator at home (I actually use the HP RPN at work). It's also the calculator I used throughout MIT, as I had not been indoctrinated into the HP cult then. Here is the "other calculator" story that I'm so proud of (shh, don't tell the HP). 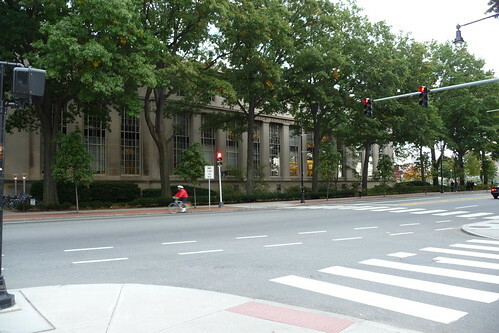 It's my last semester at MIT, and for some reason, I decided to take a management course at the Sloan School, 15.001 Managerial Economics (not offered anymore, it was basically a course for non-management majors). I pretty much ignored the class and barely made it to lectures since it was at 9am and a 20 minute walk to get there. By the end, I crammed for the final in order to get a decent grade. The day of the final, I overslept and had to rush to get to the exam. My dorm neighbor was taking the class with me and we were both running out the door to get there. As we ran across Massachusetts Avenue through a yellow light, my calculator fell on the street. The cars at the traffic light were already starting to go, so we had to wait on the other side for the light to turn red to retrieve it. And then, a car ran over it. I screamed and pointed, OMG! OMG! My calculator, I have a final, what am I going to do!?! Finally, after what seemed like an eternity, the light turned red and we ran to pick up the calculator. The display had all the LCDs lit up black, and I instinctively hit Clear a few times. And it was perfectly fine! Then we both screamed and jumped for joy, as you can imagine two crazy Asian co-eds in the middle of the street. We thought it would make a great commercial like the old Timex watch ones, but probably no one would believe it. We were giggling in disbelief the rest of the way to the exam. I kept testing it by adding and multiplying numbers together, after all, I needed to use it during the final, and wanted correct results. I was so excited about my calculator surviving, that I spent way too much time reliving the moment during the exam. Checking my transcript, I got a B, thanks to this calculator. As for your current love of RPN...I never understood the attraction. Oh yea...one less key stroke....I forgot. But then again, my mother could use my TI (or Sharp, or whatever) and balance her checkbook with it. No matter how much I could have tried, I am not sure I would ever get her to understand what a stack is, and why this was a more natural order of operations for a calculating machine to perform. My father on the other hand....he was a calculator collector of sorts. He had about every "new" calculators when they came out.